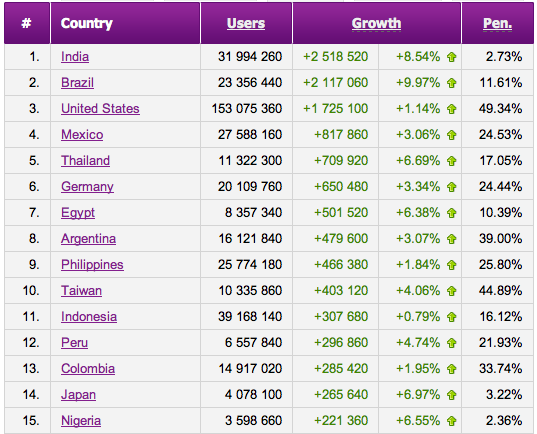 Check out the list of fastest Growing Countries on Facebook in July! July is at the end, and everyone is thinking – how did Google+ perform? We are sure that it did just well, adding 25 million users. But the question is, how did Facebook grow and penetrate in the different markets? In terms of growth, U.S. is not the fastest growing country anymore, but its India and Brazil. These countries have proved that their Facebook user growth can really rapidly grow, and even though Orkut is still a winner in Brazil, Facebook is gaining on it fast. So check out the Facebook stats growth in July, and tell us what you think! Check out the best performing brands and Socially Devoted industries in the Facebook world - this time Socialbakers takes a closer look at selected countries in Asia and Australia.